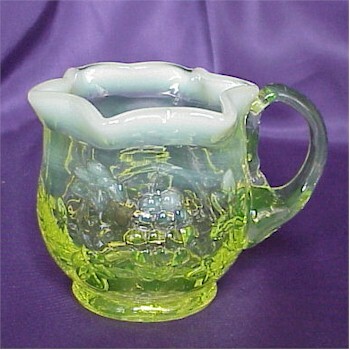 Star Creamer with Grapes in Vaseline Opalescent, Bargain Shack offers Boyd Glass, Mosser Glass, L.G. Wright, and Contemporary Collectible Glass including Vaseline Glass - J.B. Scottie Dogs, Pooche, Animal Covered Nests, Toothpick Holders, Salts, Glass Animal Figurines, Clowns, Dolls, Slippers, Vehicles, and More! Just look at this cute Star Creamer from Gibson Glass! Decorated with grapes and vines the top is formed into a beautiful star pattern that has been highlighted with beautiful opalescence. One of the star points forms the spout. This delightful creamer stands 3 inches tall and the bottom is stamped Gibson 2004. Since Gibson Glass makes very few items this is sure to become a rare treasure in your vaseline glass collection.